Furnace maintenance is a simple service that makes a huge difference. One appointment scheduled with a professional could be the difference between you staying warm throughout our cold weather and being left out in the cold. Fall is the perfect time to pay attention to your furnace. If you wait until temperatures fall, you risk having to address serious issues when you need your heating system the most. Scheduling an annual furnace tune-up is essential to every home even if you don’t have persistent problems with your heating. If you’re looking for professional furnace maintenance in the Cincinnati Metropolitan Area, our team at Bartels Heating & Cooling is the right team for the job. 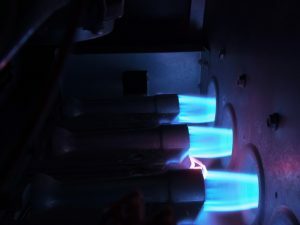 Your furnace isn’t an inherently dangerous piece of equipment, but without the right maintenance, a natural gas furnace does pose a danger to your home. Without maintenance, the likelihood of your system malfunctioning increases which poses a safety hazard to your home. During a tune-up, our team makes sure your system runs at full capacity and performs a full safety inspection to make sure your system runs smoothly. If you’re heating bill goes up without a direct cause, it’s typically because of a system’s inefficiency. An annual furnace tune-up increases the efficiency of your system. When your furnace is as efficient as possible, it doesn’t waste any extra energy meaning that your heating bills will be much lower than they would be without a tune-up. When you have your system maintained before temperatures drop, you’re greatly decreasing your chances of emergency repair needs. Emergency repair needs are both stressful and expensive because of their advanced state and their urgency. You don’t want to go without heating in our Ohio winters, so ensure that you avoid these inconveniences. When you have an annual tune-up for your furnace you’ll increase the lifespan of your system. The average lifespan of a furnace is about 15 years but without the necessary maintenance for that system, you’ll greatly decrease the lifespan. Running a furnace when it’s inefficient causes unnecessary wear and tear to your system. During a tune-up, a technician checks all your moving parts, lubricate them, and ensure that your connections are intact. Most furnaces on the market require that you have an annual tune-up performed on your system for your warranty to remain valid. This is because furnace manufacturers understand the importance of annual tune-ups for the overall health of your system. Your warranty has many benefits so don’t let them go to waste! If you’re concerned about maintaining your furnace, you’re already a step ahead. At Bartels Heating & Cooling, we have a maintenance program that includes all the services you need to keep your furnace immaculately maintained throughout the year. If you’re a member you’ll get a 15% discount on all repairs, priority services, and never have to pay any overtime fees. We’ll even call you to remind you to schedule an appointment. Make sure you’re getting the most from your furnace, contact us to schedule a maintenance appointment today.